Taipei 101 is the landmark of the Taipei City. It is a 508-meter-tall tower with 101 stories above and five below the ground level. Taipei 101 is named 101 because of the number of its floors – 101. The original name of the building is the Taipei Financial Center. Sprawling over an area of 81,072 square meters, the commercial tower has become an indicator of Taiwan’s economic progress. Every year, this attraction receives uncountable visitors. At night, the illuminated parts of the tower reflect the hues of diamond. Built in 2004, the tower was once the tallest tower in the world, until 2010, when Burj Khalifa snatched the title, with the height of 828 meters. The tower has received several awards, including American Newsweek magazine’s “the world’s new seven wonders award” in 2006, Discovery’s “Seven Engineering Wonders of the World” award in 2008, etc. Taiwan is located in the earthquake prone zone and is hit by typhoons during the summers. Thus, the architectural design of the tower had to be sturdy. The enormous gold-colored tuned mass damper weighing 660 metric tonnes, and usage of the new “megastructure” system keep the tower earthquakes and typhoon proof. The damper ball is made of steel and works as a pendulum. The elevator system in the building is record-breaking. Out of 67 elevators installed in the building, two of the elevators have made the Guinness World Record for being the fastest elevators in the world with a speed of 1,010 m/min (3,313 ft/min). It takes just 40 seconds to reach the top level (89th floor) from the ground level. The lifts have been equipped with atmospheric pressure regulation systems to obviate discomfort. 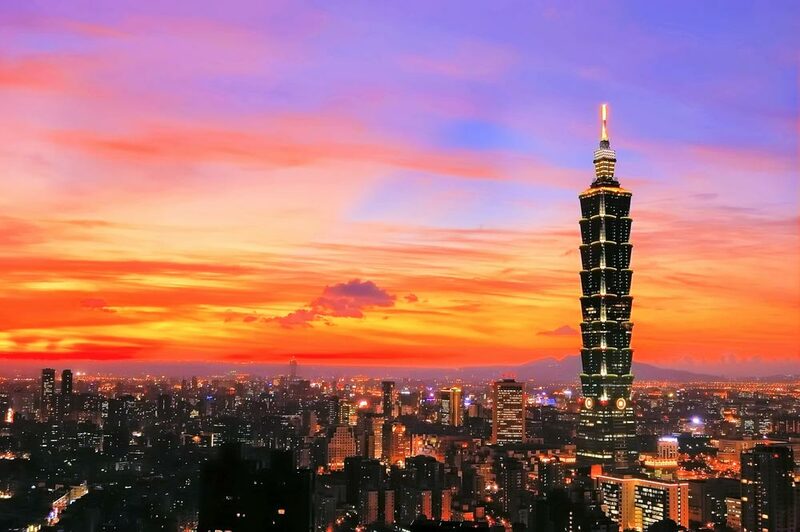 Constructed by the KTRT team, Taipei 101 skyscraper has emerged as a remarkable financial building, with the offices of big fish, such as Taiwan Stock Exchange Corporation, GOOGLE, Winterthur Insurance Group, and ABN AMRO Bank, etc. The tower’s basement is occupied by a food court and there are fashionable malls on the first five floors. The floor area of the mall is 185,806.51 square meters. The top level of the tower has a viewing deck, which offers stunning views of the surrounding landscape. If you are a patient of acrophobia, do not even think to look down, if you happen to reach the viewing deck. Taipei 101 is made of reinforced concrete and five different kinds of steel. About 380 concrete piles form the base of the tower. Taipei 101 as a green building, is eco-friendly. The building is based on the ‘Green On’ concept. There is a 10% saving of waste, water, and energy in the mall. The authorities have also applied for a LEED certificate for the building. This certification is the highly recognized green building certification issued by the US Green Building Council. You must also visit Taipei International Convention Center, Tainan Confucian Temple, Fort Zeelandia, and National Dr. Sun Yat-sen Memorial Hallmore, located around the Taipei 101 Mall. Taipei 101 is located in the Xinyi District, Taipei, Taiwan. It is easy to reach the tower. The MRT (Taipei Metro) stops at the nearby metro stations such as the Sun Yat Sen Memorial Station, or City Hall Station in Xinyi District. The skyscraper is just a 10-minute walk from these stations. The tower can be reached within 15 minutes from the Taipei Songshan Airport. As in summers, Taiwan experiences hot and humid climate, the best time to visit Taiwan is during autumn and winters. The Observatory opens daily from 9:00 a.m. to 10:00 p.m.
Taipei 101 mall hours: 11:00 a.m. to 9:30 p.m. from Sundays to Thursdays. On Fridays, Saturdays, and National Holidays, the mall opens from 11:00 a.m. till 10:00 p.m. Entry to Taipei 101 is free. You need to buy tickets to enter the Observatory. The admission fee for an adult is (New Taiwan Dollar) NT$500. The entry fee for children under 12 years of age is NT$450. Group tickets for 20 and above persons is available at NT$450. Taipei 101 was designed by architect C. Y. Lee. The gross floor area of Taipei 101 is 374,219.95 m sq. Every year a spectacular presentation of fireworks is done at Taipei 101 to welcome the New Year. Taipei 101 Tower Run-Up (Vertical Marathon) was held on May 5, 2013. The runners climbed up 91 floors (2046 steps) of the tower. It is said that the Grand Hyatt Hotel near Taipei 101 is haunted. Who is the owner of the building? The green colored Taipei 101 is a BOT project and is jointly owned by the Taipei City Government and the private sector. What is the symbolism associated with Taipei 101? The building symbolizes bamboo, which is hollow from inside, but strong from the outside. The growing bamboo in Chinese culture is a symbol of eternal strength. 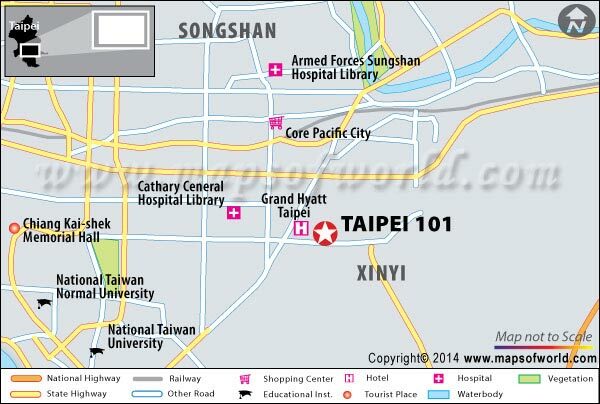 What are the coordinates of Taipei 101? Which stores are there in Taipei Mall? Starbucks, Jason’s Market Place, Uniqlo clothing store, Superdry, Page One Bookshop Private Limited, etc. Which are the places to eat inside the tower?